What can you expect on these pages? First of all we offer in our shop super quality high value paper prints and calendars of german fighter jets. In the future we plan to extend our product portfolio on all kinds of german and foreign jets. At the moment we are specialized on German Tornado jets and show them with all standard and special paintings combined with all possible load and camouflage variations which is especially interesting for modellers. 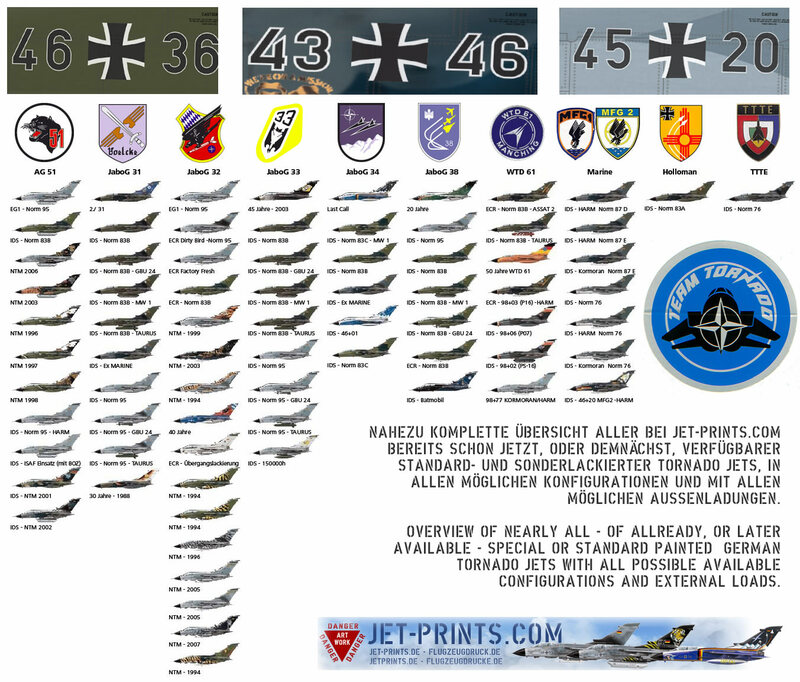 Our second aim is to be a good data base on all active and former german flying wings after WW II. 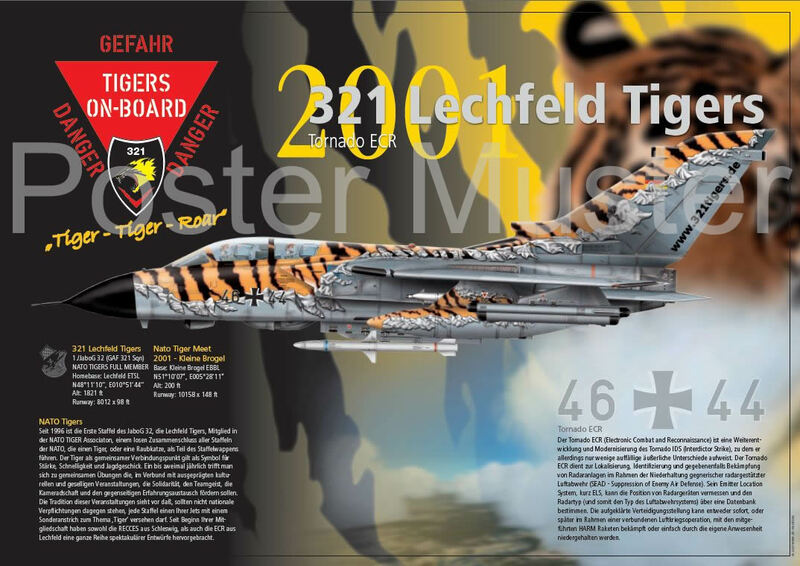 Except for the 321 Lechfeld Tigerjet 2011 are unfortunately at the moment all english-text products still in work! So, please, check the prints out what they look like with german texts (the images will be the same in English) and come back later, or order them with the original german language texts on it. The shop itself is dual language english/german. Our high value artwork prints (poster and calendars) are in standard DIN A3 (42 x 29.5 cm / 16.53'' x 11.61'') size. They feature a sillk fininished surface on strong 250 g/m2 paper and are printed in a digital process. Throughout the collection they offer a very high resemblence in technical details and colours to the original plane. With this they are the ideal specimen for model builders. We print individual names right underneath the canopy onto the fuselage (which is a common procedure in the US and other airforces for special airplanes and events). This could be a cool and exciting present for your aviation minded friends. Just order this option as a separate article in "Extras" (EUR 15.--)and specify in the order info-box what names at which place you want. gifts for squadron exchanges, visits to other military installations, exercises and so on. Our excellent printing templates are good for far larger illustrations without losing qaulity. You can order DIN A2 (+EUR 25,-) or DIN A1 (+EUR 35,-), both on 190g paper in semimatt style. If the option for the selected motiv is not yet offered, please order by email. For non-electronic and non-internet resellers do we offer attractive conditions for resale. In case you are interrested, just give us a mail or a call.